Bio-inspiration (also known as biomimetics) is the new engineering: nature's own nanotechnology. Instead of – in its crudest terms – welding large pieces of hard 'dry' right-angled metal together, scientists, architects and engineers are taking a leaf from nature's book by building intricate structures with surprising new properties, using the kind of 'wet' self-assembly techniques nature has perfected over millions of years of evolution. 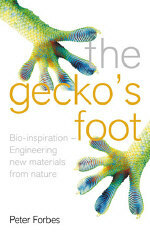 The quest to match the amazing adhesion of the gecko's foot is just one of many examples of this new ‘smart’ science. In Peter Forbes' engaging book we also discover how George de Mestral's brush with the spiny fruits of the cocklebur inspired him to invent the hook-and-loop fastener usually known by its trade name Velcro; how unfolding leaves, insect wings and space solar panels share similar Origami folding patterns; how the self-cleaning leaves of the Sacred Lotus plant have spawned a new industry of self-cleaning surfaces; and how the photonic crystal, perhaps the most important innovation since the transistor, was actually invented by the humble sea creature Aphrodita aeons ago. The new 'smart' science of Bio-inspiration is going to produce a plethora of products over the next decades that will transform our lives, and force us to look at the world in a completely new way. It is science we will be reading about in our papers very soon; it is the science of tomorrow’s world. "...not only interesting and informative, but delightful....This book fills us with wonder at what we know, and with excitement at what we might find out." "...an admirably comprehensible exploration of 'smart' science." "Comprehensive and surprisingly readable, "The Gecko's Foot" offers a fascinating account of a new frontier. .His writing is remarkably clear and scientific concepts are usually explained well enough for lay people to understand..."
"What is novel about this book is its focus on structure... Forbes is consciously trying to blur the distinction between a proper awe for the intricacy and beauty of Nature's nanostructures and an appreciation of the ingenuity of human engineers who try to emulate them, and he usefully demolishes the case for any remaining paranoias about self-replicating nanobots." "This book should be read by anyone interested in the latest trends in science and engineering." "Just when you begin to think that every book being published is about the origins of human beings or some aspect of human development, out pops a gem like The Gecko's Foot. And it's no ordinary gem, it's a brilliant one...This has to be one of the best popular science books of 2005. Highly recommended." "The general readers for whom this book is intended will enjoy it, and it will give them some appreciation of a fascinating field." "Forbes gives a sense of scientists not as laboratory drudges but as a band of wide-eyed innocents alert to all in nature and the arts. And by apposite quotations, he makes a good case for the quality of poetic alongside scientific observation..."Rather than wait until some of these technologies have become commonplace," he explains, "I have tried to capture the Wordsworthian 'bliss-it-was-in-that-dawn-to-be-alive' moment of seeing what was, until 15 years ago, a wholly unexpected science taking shape". He has succeeded splendidly." "Forbes conveys this excitement well...Ultimately, this is a book about the majesty of nature and man's intermittently successful efforts to adapt its mechanisms to meet some of his evolved needs." "...a lively and inspirational book...as entertaining as a box of assorted sherbets - each essay fizzes in its own delicious way."